Magic Convention Guide » Blog Archive » 53rd Bristol Day of Magic – The Best Yet! 53rd Bristol Day of Magic – The Best Yet! 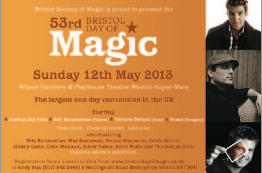 Welcome to the 53rd Bristol Day of Magic- the best yet! So it’s that time already! The biggest one day convention in the UK is back, and it’s back with some great names and new events. The convention will have lectures and close up, but new this year there will be two great close up master class’s! Get closer to the act, ask questions, and be totally interactive! Also for the first ever time Bristol will have its own competition on the Saturday night, a chance for you to battle your fellow magicians and win the much to be coveted brand new magic trophy ‘THE BRISTOL BUCKET’ And let’s not forget the evening gala show which this year includes stars from the TV as well as a FSIM world Champion. Jimmy Carlo – A master when it comes to children’s entertaining and Magic, Joshua Jay – All the way from the USA, a great chance to see Joshua lecture in his own unique style, Soma -from Hungary – The FISM Grand Prix winner will be delivering a great lecture on putting your act together and performance, a must for anyone who performs in front of people!